The Dow Jones Industrial Average announced today that it is removing Alcoa, Bank of America, and Hewlett-Packard from its 30-company index. Goldman Sachs, Nike, and Visa are in. [The Dow] is weighted not based on the size or importance of the company, but by its per-share price. So IBM, with its $184 per-share price, counts more than four times as much as Coca-Cola, at $39 a share, even though the two have about the same stock market capitalization. Okay, yes, the DJIA is an overrated symbol. But it's a fun overrated symbol. The economy is impossibly complicated, and even sophisticated attempts to summarize its health and evolution are, inevitably, oversimplifications. The Dow, which limits its particular oversimplification to the publicly traded stock of 30 companies, is constantly hauling new companies into the boat before casting them overboard. In 2008, Bank of America and Kraft replaced Altria and Honeywell. Four years later, Bank of America and Kraft have been replaced, themselves. This is useful, how? I'd like to propose that the Dow Jones Industrial Average become the Dow Jones Industrial Archive. Let's just pick 30 stocks and never change them again. It wouldn't be the best reflection of an evolving economy. In fact, it would be a terrible reflection of an evolving economy. 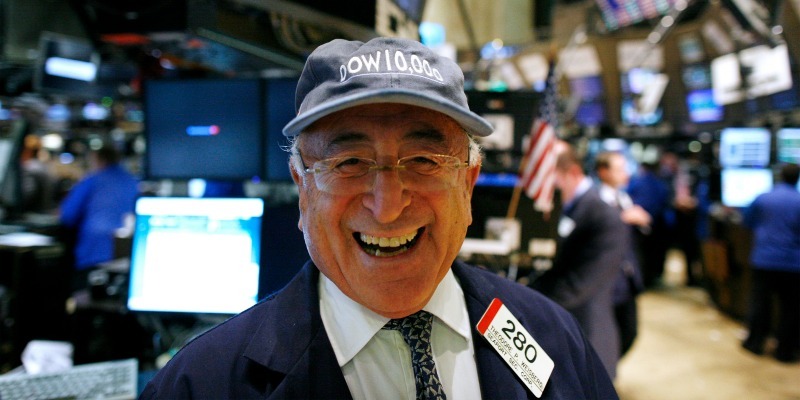 But that's okay, because we have the Standard & Poor’s 500 index and Wilshire 5000, which are much better simplifications for traders and readers. Instead, the Dow Jones Industrial Archive would be a beautiful reflection of the economy we thought we had, but are instead leaving behind. 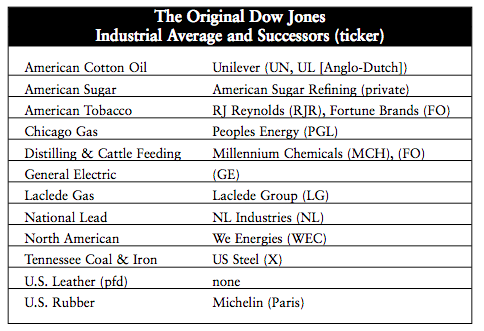 When the Dow Jones Industrial Average launched in 1896, it smelled like a turn-of-the-century factory farm -- nothing but oil, iron, cows, and cotton. You know. America. Today, practically all of these companies -- Tennessee Coal & Iron, American Cotton Oil, Distilling & Cattle Feeding -- have been gobbled up by conglomerates that you have and haven't heard of. Only GE remains. Only the U.S. Leather trust is essentially defunct. But I like that. We had an industrial-dominated economy, and now we don't. New time, new index. DJIA II for the auto and aerospace economy. DJIA III for the computer/financial economy. And so on. The value to creating oversimplified theories of the economy is planting a stake in the ground and learning some time later why and how you were wrong. The Dow isn't a very good index. It would be a better time-capsule.